I started last week happily walking towards Santiago. We* embarked on a mini-camino, the last 5 etapas on the Camino del Norte. Since we were only doing 5 days’ worth of walking, our bags were agreeably lightweight. But light is never light enough, and to be fair, our bags’ lightness was due more to the fact that we only had 5 days than to any great planning and equipment on our part. After all, how heavy can you go with just 5 t-shirts, 5 pairs of underwear and a sleeping bag? 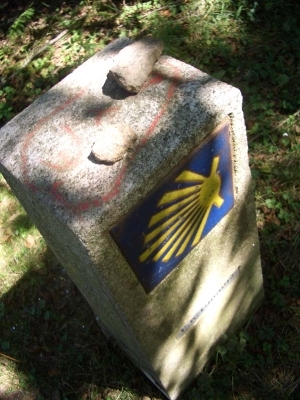 If a longer camino is undertaken however, such things matter a great deal. One pilgrim we came across had started walking from somewhere south of Paris: a total of 2000+ kilometres to Santiago and he’d been at it for 11 weeks. If you’re away for such a long time some clothes-washing must creep into your itinerary, or you’ll end up getting the stinky pilgrim award. The premise is that every day upon getting at the hostel/pension/stop for the night, you wash your clothes; and in the north of Spain it will rain in summer too. Hence the need for quick-drying stuff. Oh, and the list evidently includes the stuff you’d be wearing. Feel free to add your take on this one! Kind of like these. I favour the kind that are quick-drying, have pockets on the side like combat pants, and have a zipper halfway down to convert into shorts in case the weather gets too hot. Depending on the time of the year, you might go extremely lightweight – I prize a 600-gram Gelert sleeping bag which packs into the size of two fists. This can serve as a stand-alone sheet if the dorm is nice n’ warm. Put inside a sleeping bag, it further insulates. To sleep in and wander around in the evening. Unless you travel in summer, in the evenings it might get cold to wander around in flip-flops. And you might want to let the trekking boots air a little! In case it gets cold. This is the stuff of miracles. The probability of getting blisters goes down so much, you shouldn’t even think of passing on this one. A super-effective way of dealing with blisters: puncture them from one side to another with a needle, passing the thread right through the blister. The liquid comes out and the thread keeps the blister from re-forming. Some people argue it’s unhygienic, but you can always clean the thread with alcohol before passing it through your skin.